I think I’m just going to refer to it as ‘The Neil Lomax Curse’. Since Lomax led the lowly Cardinals back to some semblance of respectability in the mid-1980s the franchise has been for the most part (outside of a few seasons here and there with Kurt Warner, Carson Palmer, and Jake Plummer) has never really had a consistent franchise QB at the helm. You know, that consistent leader that they could lean on for 5-7 years? – Amazingly it just hasn’t happened. While it is shocking how many QBs Cleveland has gone through, Arizona has done in many QBs in its own right. 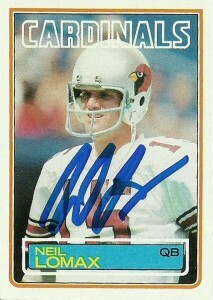 In fact, statistically speaking, I could make an argument for Neil being the greatest quarterback the Cardinals have ever had. As far as cards go, Topps 1985 was so different than what Topps had ever done that people still today see it as a pinnacle of card design. I think it really epitomized the 80s with large bold type set on its side fighting with the photo for command of the canvas. Like the 80s it screamed, “Larger than life.” While this Topps 1983 just bored my pants off initially, it was a step in a different direction for Topps than in previous years. The marquee is minimally invasive and the team name placed eloquently on the image- in an era well before Photoshop, this took a fair amount of work. One of the Akron Acquisition, I got these autographs off of a friend who was exiting the hobby. I paid a few extra bucks as a premium to help him out, and I hope that he has been able to put his life back together. Wow… and with that Tommy Jeter vaults into the top 5 worst autographs I’ve ever seen. 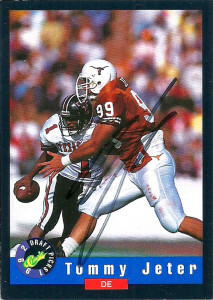 I mean don’t get me wrong… I’m happy and all that the Longhorn Legend signed these 2 cards for me, but this autograph is not really legible and they don’t really match at all. I guess I can make out a loop for ‘J’ and the hook at the front of the signature could count as a ‘T’ but this is a far cry from what I originally got from him at Eagles Training Camp back in 1994. I wanted to get Tommy on these two additional cards I had for years. The Gameday 1992 was probably my favorite outside of the Star Pics entry and the Classic I couldn’t pass up since it’s a great action shot. Really, this was more like a failure and then success, but when I get the RTS and I’m able to flip it right back out to a new address- I just count them one and the same. Jeter is a family man now. He’s a huge fan of his kids who are all involved in sports at some level. 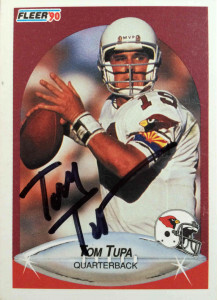 As of 2017, Tommy is a Regional Manager for ACME Brick Co.
Tom Tupa was selected in the 3rd round of the 1988 draft by the then Phoenix Cardinals out of Ohio State. 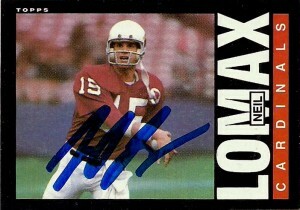 Unbeknownst to even the Cardinals, the franchise was at the beginning of a long search to find an answer at quarterback to replace long time quarterback Neil Lomax– whose career quickly declined after 1988, due to injury and an arthritic hip. 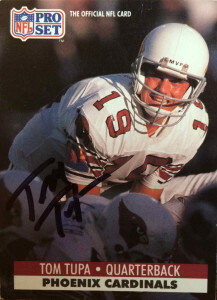 After Lomax’s sudden departure left Phoenix in a lurch in 1989, the Cardinals staffed a platoon at quarterback with Gary Hogeboom, Timm Rosenbach, and Tom sharing the workload. Tom threw for 973 yards and 3 TDs- to 9 interceptions, while suiting up for 14 contests. He also got to showcase his impressive skills as a punter filling in for injured starter Rich Camarillo in a pinch. 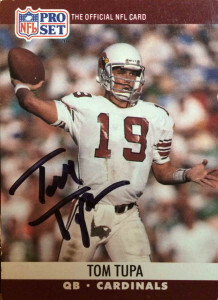 After not seeing any playtime in 1990, Tom spent one final season in Phoenix. He’d win 4 games in 11 starts and throw for a career high 2053 yards and 6 TDs. 1991 led to a short stay in Indianapolis for Tom. Afterwards he bolted for Cleveland. He spent the next three seasons with the Browns. It’d be in 1994 that Tom finally made a rare positional move from quarterback to punter. One could also argue at this point, that Tom had become the best emergency quarterback in the NFL. In 1996, Tupa signed with the New England Patriots and punted for them through the 1998 season. 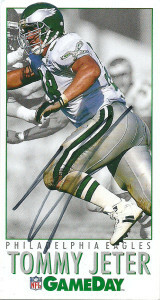 In 1999, Tom had his finest season as a pro playing for the New York Jets. He’d earn Pro Bowl and All Pro Honors after the season punting 81 times for 3659 yards. Tupa played for the Jets through the 2001 season, before playing for the Buccaneers for 2002 and 2003. His final season came in 2004 with the Redskins – a year in which Tom set career highs for punts (103) and yards (4544), earning him an invitation as a Pro Bowl alternate. In a small bit of trivia, Tom is known as ‘Two Point Tupa’, for scoring the league’s first 2 point conversion, and repeating it two more times later in the season. Tom as of 2016 was a coach at a local high school in Ohio. He signed these 3 cards for me in a bit over a week. ProSet had a major soft spot for Tom and I wasn’t really sure why, covering him in their 1990 and 1991 entries. Notably Score and Topps didn’t make early first or second year cards of Tom. Fleer 1990 was the company’s first foray back into the football card market in many years. The set was novel looking enough, with nice action shots, but the design of the card itself did not age well with the abstract metal football logo, and the random team helmet just sort of haphazardly thrown on there.